"The Rise and Fall of a Jazz Age Con Man and the Invention of Christmas in New York"
Aired on Friday, December 18th. 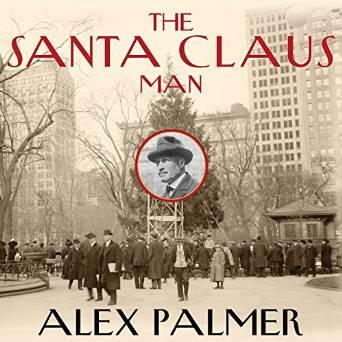 On this edition of ST, an enjoyable discussion with writer Alex Palmer, whose new book is called "The Santa Claus Man: The Rise and Fall of a Jazz Age Con Man and the Invention of Christmas in New York." This fascinating and often entertaining work of popular history describes the so-called Santa Claus Association, which thrived in New York City in the 1920s, while also depicting the origin and development of Christmas itself as the modern-day, consumer-driven juggernaut that we're all quite familiar with now. The book offers, per Publishers Weekly, "a highly readable account of the evolution of one of America's favorite holidays and traditions." And further, from Jean Ashton, who is Director Emerita of the New York Historical Society: "Gun-toting boy scouts? Baby cribs hung from skyscraper windows? A Christmas building with a giant stained-glass Santa Claus in midtown New York? Those are a few ploys of scam artist and quasi-philanthropist John Gluck, as told in Alex Palmer's lively and well-researched biography of him. 'The Santa Claus Man' draws a picture of an era in New York when the pockets of the wealthy were open to anyone who was willing to buy into schemes with kind-hearted promises of help to the poor. Gluck's greatest success, the Santa Claus Association, attracted society ladies and movie stars by promising to fulfill the wishes of children who wrote to Santa begging for gifts, until it was investigated by an alert and suspicious public welfare official. Palmer's book is fun to read and raises questions about gullibility and fraud even more relevant today than they were in the 1920s." "A Search for America's Christmas Present"
"The First Christmas: What the Gospels Really Teach about Jesus's Birth"
Traffic came to a halt on Wednesday when bundles of new Hong Kong 500 dollar notes flew out of a security van. Drivers and passersby were not shy about taking advantage of the Christmas Eve windfall. Video posted on the BBC shows people abandoning their cars and scrambling to pick up bills strewn across a busy eight-lane roadway. The cash blizzard littered the Wan Chai district of Hong Kong around lunchtime. There's been some consternation on the Web about what happened this weekend at a post office in Silver Spring, Md., when three Christmas carolers — all decked out in shawls, bonnets and a top hat (for the guy) — popped in and started singing. It seems that one of the USPS managers on duty jumped into action, telling the trio that they couldn't do that because they were on government property.